Before going into the business of testing mattresses and reviewing them, I never really understood how much a good mattress can change one’s life. Whenever you’re sleeping on a mattress that doesn’t support you as it should, you are giving up comfort, hours of interrupted sleep, pressure point relief and increasing the chances of waking up with sore muscles and joints the next day, as well as with a grumpy attitude. With mattresses, it can never be love at first sight. It builds up to a healthy relationship, and only in time will you understand how and if a specific bed is really what you need. There’s a good reason why manufacturers offer these generous trial periods: because you need to get used to a mattress and a mattress needs to get used to you. 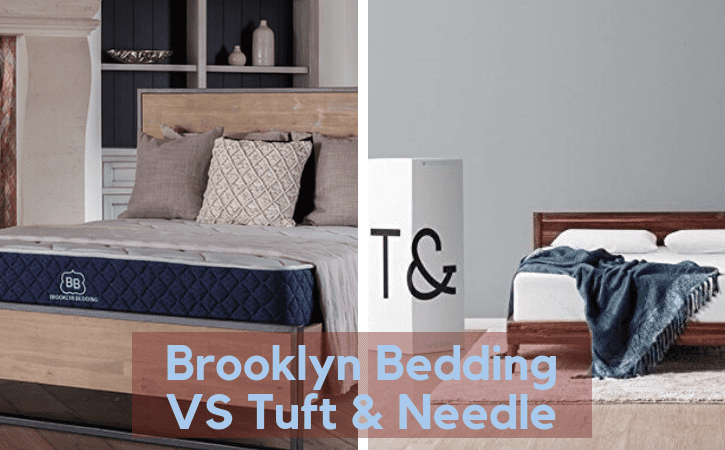 The Brooklyn Bedding Signature and the Tuft & Needle Original mattress are very different from one another. One of them is focused on delivering quality for people on a tight budget, while the other is designed to provide support and pressure point relief to an audience as broad as possible. The Signature mattress has made its product available in three different firmness options, ranging from plush to firm, depending on the customer’s favorite sleeping position. 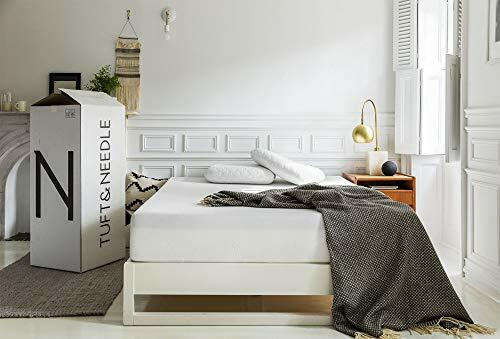 The Tuft & Needle Original, on the other hand, was focused on developing a product that’s meant to please both sleeping partners as much as possible, while preventing mad spending in the process. 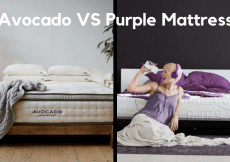 While both of them are viable mattress choices, it’s important to understand what each of them brings to the table before adding either of them to your shopping cart. The cotton cover of the Signature mattress is really pleasant to the touch. It has a soft and smooth feel to it while making the material feel highly breathable. Polyester was added to the blend in order to ensure shrinking-resistance and to prevents wrinkles. The TitanFlex foam used to create the comfort layer seems like a wise choice. The infusion with TitaniumGel will ensure that the mattress does not retain heat, but instead released a cool vibe. Because the material is very similar to latex, the mattress has a nice bounce (the pocketed coil layer also contributes to this feature), which makes it very comfortable to switch sleeping position without feeling like you’re stuck in the mattress. Right below the two-inch layer of TitanFlex foam lies another similar layer. However, Brooklyn has used a firmer version of the same type of foam, for adding support to the construction. This particular layer helps transition between the comfort block of foam and the pocketed coils system that’s also the core of the mattress. Since this is a hybrid mattress, the combination between the latex-like foam and pocketed coils was almost intuitive. The support system of the Signature mattress is a six-inch-thick layer of coils that bring multiple benefits to the sleeper. The added bounciness work perfectly in tandem with the foam above, which the structure of the layer allows a great amount of air to pass through the coils, helping regulate temperature and keeping the sleeper cool. The coils are individually-wrapped, which means they will only respond under direct pressure, preventing motion transfer from waking up your sleep partner. Of course, there is a thin layer of high-density foam added to the base of the mattress. This layer is always a good idea and a smart integration that helps add durability to a mattress, especially when said mattress has a pocketed coils system. You always want a layer to stand in between the foundation of the mattress and the actual platform of your bed or your bed’s frame. 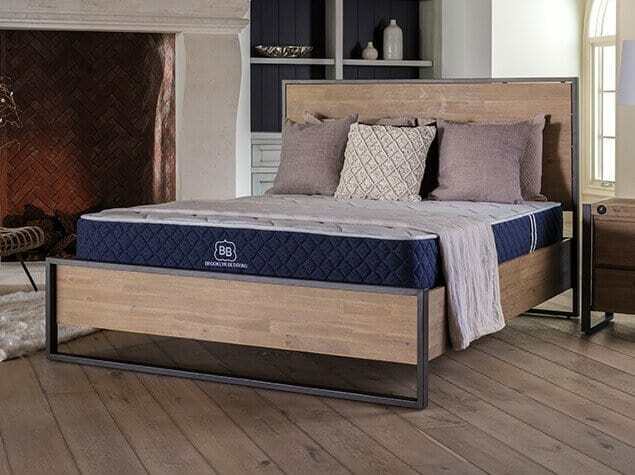 The Signature mattress is available in three different levels of firmness that are suitable for people with different needs and levels of support. 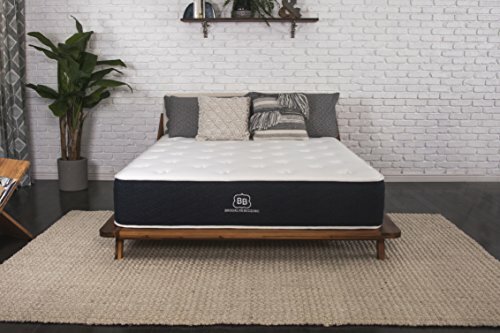 The softer version of this mattress has a rating that varies from 3 to 5 (out of a possible 10) and is best suited for people who like to sleep on the side and require all the pressure point relief they can get. 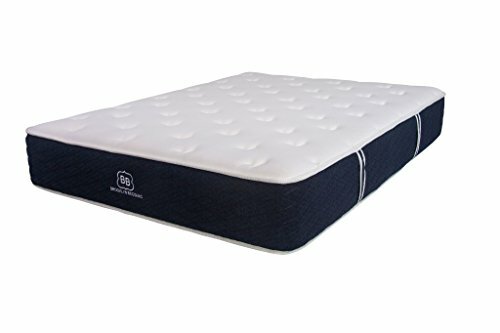 The plush version of this mattress also has a cradle-like feel to it and will make the sleeper sink into the mattress. Combination sleepers are much better off purchasing the medium mattress, as it provides a great balance between support and comfort. It also keeps the sleeper on top of the mattress, rather than providing that feeling of sinking in. The medium firmness of the mattress has a rating that varies between 5 and 7. As for people who want a firm mattress, they can pick the firm Signature bed, with a firmness rating between 7 and 9. This model will provide better lumbar support and a flatter sleeping surface, for people who dislike that “sinking in” feeling altogether. Always remember that the firmness ratings are varied for the same type of mattress because people of different weights will feel the firmness of a mattress differently. We’re going to examine the pressure points and feel of the medium firm Signature mattress, to draw a further conclusion on who would sleep best on it. Back sleepers will be happy to know that the quilted cover does a great job in providing lumbar support and feeling in the gap that’s normally created in your back area. Despite this not being the firmest Signature mattress, the pocketed coils so a great job in pushing your body to stay on top of the mattress, rather than sinking into it. Side sleepers will feel a great deal of pressure relief on the medium firm Signature mattress. That because the soft comfort layer cradles the body and supports the shoulders and the hips by allowing them to sink into the mattress as much as they need, while the firmer transition layer prevents that sinkage from becoming uncomfortable. As you roll over on your stomach, you will notice that your hips start to sink deeper into a mattress. This means that you would be better off with the firmest version of the Signature mattress if you spend most of your night resting in this position. When you invest in a long term-use product such as a new mattress, it’s important to analyze the details which give you an idea of how long a said product can last. With the Signature mattress, we can examine the durability of the bed by looking and the density of the foam used, as well as the coil gauge. Here’s what you need to know: when you’re dealing with polyfoam layers, you want the product to have about 1.8 lbs. per cubic foot. 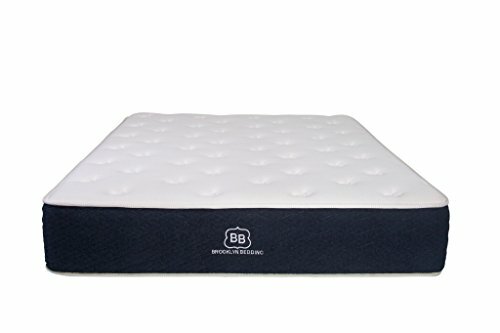 The Signature mattress Brooklyn Signature 11″ Hybrid Mattress with Patented TitanFlex Pressure Relieving Foam, Queen Mediumhas a density of 3.5 in both its upper foam layers and a density of 1.8 in the base layer. This translates into good durability chances. For a Queen size mattress, you want a coil count of at least 800, and the Signature model has 1,024, which is another good durability indicator. Sharing a bed with a partner basically demands good motion transfer. This means that the mattress is constructed in such a way as to absorb the motion caused by one’s movements up to a point where their other one doesn’t feel them or get woken up by them. Typically, individually wrapped coils do a really good job in minimizing motion transfer, as they only bend under direct pressure and don’t influence movement in the coils that surround them. 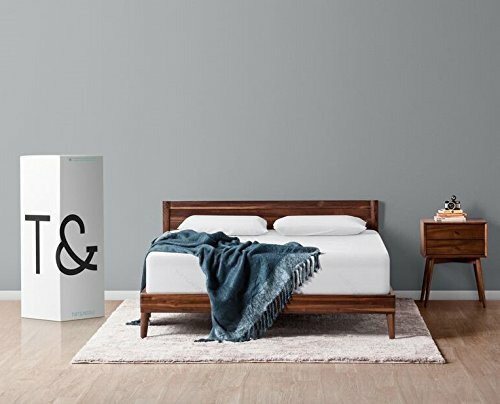 It’s, therefore, safe to say that the Signatura mattress is a bed that you’ll love to share with your significant other, no matter how fussy he or she is during the night. The Tuft & Needle Original mattress has a cover made with a blend of Tactel and polyester. The results is a cover that’s both stretchy and thin, which means it has some added benefits. First off, the thin cover allows for air to pass freely through its surface, preventing you from running too hot. That’s also because Tactel dries quicker compared to cotton. Second, because the layer is thin, you can easily interact with the memory foam layer underneath. 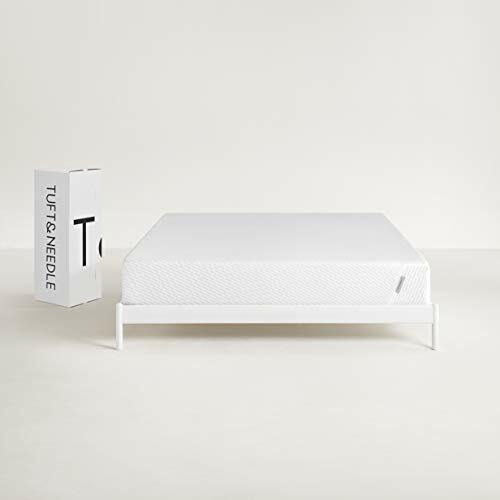 The Tuft & Needle Original mattress has a very basic construction, which is understandable considering that’s it’s one of the most affordable memory foam mattresses on the market. The comfort layer of the mattress is made with Tuft & Needle Adaptive® Foam, a material that quickly responds to pressure and prevents you from sinking into the surface of the mattress. With three inches in thickness, this layer does a fairly good job in contouring your body and giving you the support you need. The foundation and the base layer of the mattress is a giant block of high-density polyfoam, which measures seven inches in thickness. This helps the mattress stay stable, while also giving you support. It gives the mattress its structure and makes it more durable in the long run. We always like to remind our readers that the firmness and feel of a mattress not only go hand-in-hand, but they are hard to pinpoint with a firm conviction since every individual is different in terms of weight, body shape, sleeping preferences, and nocturnal habits. On average, the Tuft & Needle Original mattress has a firmness rating that varies between 6 and 7, which is pretty much the industry average for a medium firm mattress. There are a few unexpected surprised here, but we’ll get to that in our next section of this review. With a rather basic construction, we expected the Tuft & Needle Original to provide good support, but nothing off the charts or surprising. The mattress does a decent job in providing support no matter which of the three sleeping positions you prefer. However, if you are a heavier side sleeper, the comfort layer will immediately sink into the foundation of the mattress, particularly in your shoulders and hips area, which may result in significant pressure point pain on the long run. If you prefer a softer mattress, you can either choose to buy a topper or opt for the Tuft & Needle Mint mattress, which has a plusher comfort layer. For the average back sleeper, the mattress does a good job in supporting the lumbar region, and it’s safe to say that the results are pretty much what you’d expect given the combination between the good price and the quality of the materials used. When you share your bed with a partner, it’s important to have minimal motion transfer. This way, if one of you gets fussy during the night, the other one won’t wake up because of the movements. While the comfort layer of the Tuft & Needle Original has a quick response to pressure, the mattress doesn’t sport the best motion transfer we’ve seen. It’s true that disruption is kept to a minimum and there are little chances of you waking up because of your partner’s movements, but you will feel your body slightly moving when your partner gets in and out of bed or switches positions. 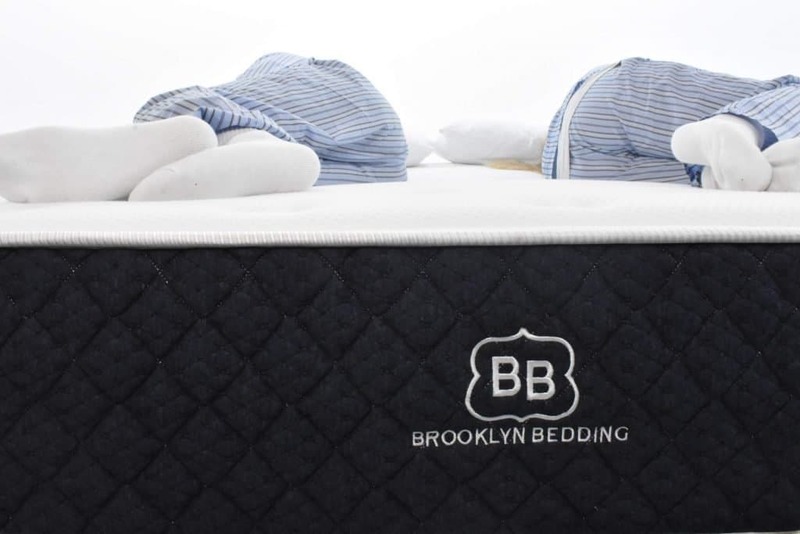 The first thing you have to appreciate about the Brooklyn Bedding Signature mattress is that there are three options available, which means that, in terms of firmness at least, there’s most likely one that’s suitable for your needs. 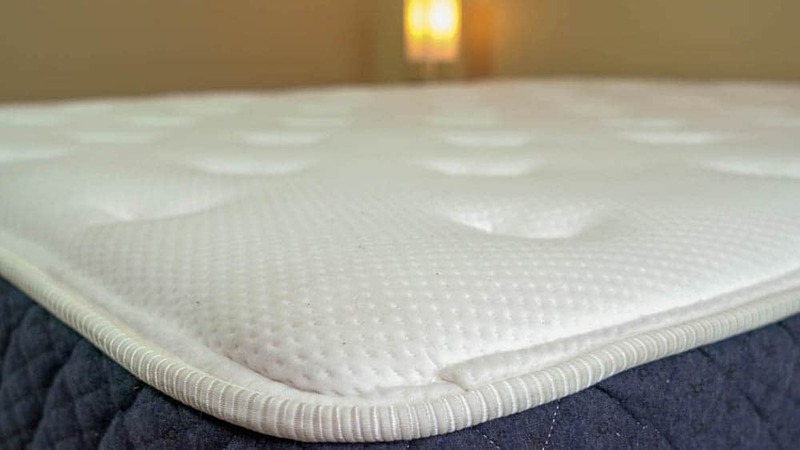 Even if the comfort layer of the mattress is maybe a little too soft to support stomach sleepers, there is a lot of excellent pressure relief. 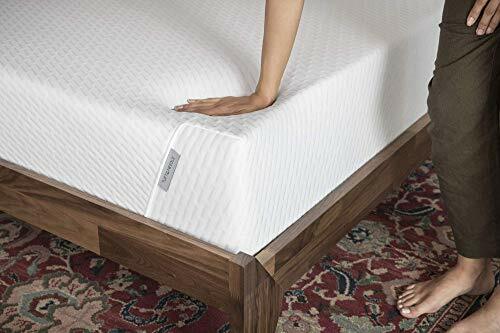 Combined with the bounciness brought by the pocketed coils layer that works hand-in-hand with the latex-like foam, you’ll easily be able to switch sleeping position without feeling like you’re stuck in the mattress. Because of its construction, the mattress offers great pressure relief for side sleepers, which is basically the pickiest sleeping position of all. Last, but not least, we recommend the Signature mattress to all those of you that want to stay cool during the night, as the TitaniumGel plus the pocketed coil system don’t allow any heat retention. By analyzing the main characteristics of the Tuft & Needle Original, we can pretty much establish which is the target market for this bed. Considering its capacity of supporting the average weight sleeper in the most common positions, the mattress can be a good choice for couples that have either different or similar sleeping habits and want a mattress that can accommodate both of them. If you’re looking for a good memory foam mattress, but you’re on a budget and can’t afford to spend thousands of dollars on one, the Tuft & Needle Original might be a good choice for you as well. As always, the best choice is the one that helps you get a full eight hours of interrupted sleep and doesn’t leave you waking up with sore muscles and joints in the morning. The Signature and the Tuft & Needle Original mattress are pretty different from one another. 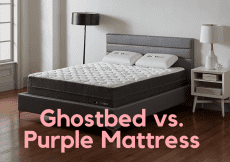 The latter is a good choice for people who are on a tight budget but still want (and deserve) to enjoy a bed that’s made by a respectable manufacturer. It’s also a viable choice for sleeping partners that sport similar weights and enjoy sleeping in the same positions. The Signature mattress, on the other hand, is more suitable for people in need of a bouncier bed. The combination between pocketed coils and latex-like foam will help the sleeper transition between sleeping positions, but also aids customers that have limited mobility and could use an extra push when attempting to get in and out of bed. It’s also a great product for people who love a durable hybrid mattress that cools them down since it integrates TitaniumGel and a lot of additional space between the pocketed coils to facilitate airflow. 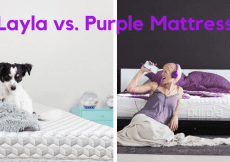 Whichever of these two mattresses you choose, you can benefit from the trial periods that allow you to test the mattresses for three months before deciding if they’re ultimately the right choice for you.